Today I have the pleasure of presenting “An Awesometalk With” Mr. Robert Krauss, Historian and Photo Archivist for the 509th Composite Group. The 509th Composite Group was created to plan and execute the deployment of the first atomic bombs against Germany and Japan. 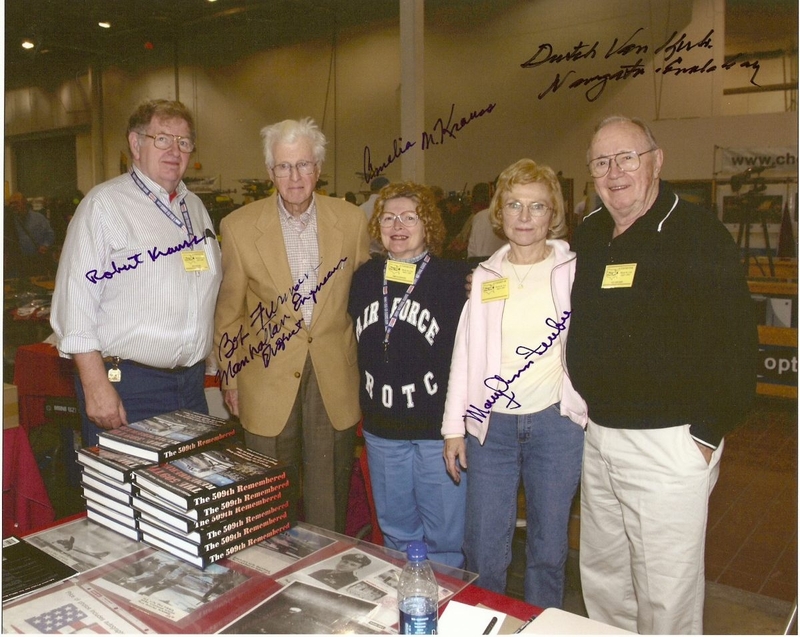 Upon completing their missions, many feel their efforts brought a quick end to World War II. Mr. Krauss has spent quite a few years in the company of many of these airmen and their families and has one of the largest, if not the largest, collection of photographs relating to the 509th. Mr. Krauss has been the acting Chairman of the 509th Reunion Committee since 2001. He publishes a bi-monthly newsletter and manages his website “The 509th Composite Group” at www.enolagay509th.com. And he has written a book, “The 509th Remembered” which is a wonderful testament, containing over 350 pages of information and photographs on the men, the planes and the circumstances that made up the 509th. It was an honor speaking with Mr. Krauss and I hope you really enjoy our chat. BC: Welcome Mr. Krauss to A Little Touch of History. RK: Thank you. It’s nice to be here. BC: How long have you been involved with the 509th? RK: Well I first got heavily involved in 1990 when we went to one of their reunions. And I say we, because my wife and son, who was 10 years old at the time, all went to Wendover. At the time it was the largest reunion that they had had. There were well over 300 people there. There was one more in 1995 in Albuquerque that also had that many. And that was probably the two peak reunions of the 509th. After that the numbers just kind of went downhill. And now of course it’s very slim because of their ages. I spoke to one within the last hour that’s 92. They range from as young as 84 to 92-93. BC: Are you a veteran yourself? RK: No. I was never in the service. BC: Are you a historian by trade? RK: No. I guess it’s hard to define. I guess years ago when people had an interest in this sort of stuff they would refer to themselves as amateur historians. But you know, I’ve never really seen a class for historians. So, I guess at some point, if you do it long enough, you become a historian and people start gravitating towards you. So I just call myself a historian now. BC: I was at a conference this past weekend and they listed me as a historian just because I write a blog on history. And well…I’m still struggling with that one. But maybe in a few years from now I’ll accept that. RK: Well, I think that’s what happens. It comes with age. And my age, by the way is 65. So I am probably a tad older than what the 509th children would be, the ones that we see coming to reunions. BC: In 1990, was it just something that you wanted to go to just out of interest? RK: No, I guess I probably should have finished that statement. I first started somewhere in the late 1980s. I worked as a buyer over the years, a purchasing agent. And it’s always been a high pressure job. And so looking for relief, I’d go to the library during lunch hour. I had an interest in World War II and picked up a book on the “Enola Gay” one day and started reading about it. I was fascinated to learn that there were more than just the “Enola Gay” and the “Bockscar” and I just wanted to learn more about it. So through correspondence with one of the “Bockscar” veterans in Chicago I got the idea that I could go to their reunion. I mean they wouldn’t kick me out if I went (laughing)…that sort of thing! So I wrote to the reunion organizer, who at the time was George Marquardt, an airplane commander. In fact, he was the photo airplane commander on the first mission and then he was the Kokura weather plane commander on the second mission. But at any rate, George said “Fine, come on out”! But I went as a visitor, not as an attendee. I found out I could have registered, but I didn’t. We just went as visitors. I became an official attendee in 1992 at the next reunion. But in 1990, I met a lot of the guys and started learning a lot about the planes and crews. And so what I started doing was collecting images of the crews and the planes and as I was doing this, I realized, nobody else was! So this just continued on until my collection became quite large. BC: I understand, if I read your bio correctly, that in 2001 you chaired or had starting chairing the reunion? RK: Right. That’s correct! I think it was in 2000, that there was a reunion in Kansas City. The fellow who ran the reunion, his name was Gerry Feldman. And Gerry was a Bomb Wing veteran. About March or April, 1946, the 509th Composite Group disbanded and became the 509th Bomb Wing. These guys were the ones that did the experimental bombing at Bikini. They also did the operation called Crossroads, Test Able and Test Baker. One was above ground, one was below the water, targeting captured and surplus ships and measuring the effects of radiation to animals on board the ships. RK: At any rate, Feldman was a veteran of Operation Crossroads. So that made him a little bit younger. Well, at the business meeting, when the time came for having another reunion, nobody was volunteering to be the chairman. And I had remembered that I really enjoyed Wendover when I went there in 1990. So I just said to my wife “Do you mind if we do a reunion”? And she looked at me and said, “Yes, I do mind”! And I said “Well, I’m going to do it anyway”! RK: Let me give you a little background on that. The President of the Wendover Historic Airfield happened to come to this reunion and he spent a lot of time with me because I set up a memorabilia display. And so we were talking on the side saying that if something were to happen he’d be happy to co-host the reunion. So I knew that I would have help being that we kind of had an inside there. I mean it wasn’t all out of the clear blue sky type of thing. We had never run a reunion before. But we did it and they attendees enjoyed it so much that they kept asking us to do it over again. And so we have done every reunion since. Except for 2007 in which we had to take care of some health problems. Another group ran that reunion but we did it again in 2008 and we were elected to do it again in 2009. BC: Terrific. And you’re glad to be doing it? RK: Yeah, it’s a labor of love. All these veterans now over the years have gotten to know my wife and son. And I want to say that we look at them as family and I think they look at us the same way. BC: That’s terrific. It was funny that you were a buyer in the 80’s. I was also a buyer in the 80’s. There must be something about history and buying (chuckle). What were you buying? RK: Well, I started out in 1970 just out of pure luck. A fellow who ran a foundry, a General Manager, hired me as a foundry buyer. So I was buying commodities for making castings…cast iron castings. In ’73 I quit that job and went to work for a valve manufacturer. And that’s what I was doing. I was a casting buyer. In 1974-75, those were days where you had to plan because castings were on allocation. Lead times were 35 weeks. RK: And then around ’78, all of a sudden the curtain came down about these 35 week lead time. People were canceling orders left and right, almost like what you are seeing now with the economy. BC: You’re out of that business now? You’re retired? RK: Yes, (laughing). Well not voluntarily did I retire. I hit the retirement age fortunately, but the last company I worked for, like most of the manufacturing companies I worked for, closed. I was a Buyer and Stockroom Supervisor for a Division of SPX Corporation who was a major supplier to Ford Motor Company. And our particular plant was making magnesium die castings which went in the steering column of the Ford Taurus. At any rate, Ford decided to go to China with their castings and that did us in. So they just closed the plant. And I was within a year of retirement. BC: I understand that you wrote a book called “The 509th Remembered”. Is it a commemorative book that you wrote for one of those reunions? RK: That’s how it started out. We thought that the reunion at Wendover in 2001 was going to be the last one. And so what we did was … I came up with this idea of doing this commemorative book of Wendover stories. We gathered all the information and all the stories we could find that had been printed about Wendover from what the fellows had written to me. Plus letters they had written. I also used pictures from my collection. So we came up with about a 75 page to 100 page booklet. And it was 8” x 10” and it was nicely illustrated and so on. That basically was the foundation for our book. And so when we did the reunion in the following year we solicited more stories. I never really thought that it would ever end up as a hard cover book. I never planned on being an editor. RK: It was a joint thing. My wife typed every word in the book. There’s probably 380 pages. Something like that. BC: I was just going to comment on how large it had grown. RK: Yeah, it’s that big! BC: Currently, is this the last version or are you still getting material coming in? RK: Well (laughing) we do a newsletter in which we try to put out every two months. And there are still some people sending letters. And some of them are worthy of putting them in the book. But at this stage of the game, I’ve got a good inventory of books out in my pole barn and I don’t know that I want to add more to the book. BC: I guess would that mean scrapping those to reprint? RK: No. I would wait until they were all sold. But the trouble is right now with the economy as such, that sales of the book are just very negligible. I mean it’s very down. BC: I’d like to put on my blog that people can buy your book right from your website. RK: The Enola Gay 509th. RK: That’s the site. And there is a section there where you can order autographed photos or models or books. And the book is featured there. RK: We had had a military book publisher contact us but we would have had to give up the rights to the book. So we decided not to do that. The only way we market the book is through the website and appearances. I occasionally will put some on eBay. But typically, what we try to do is get one of the veterans to go to a show with us. We do military collector shows, appearances at schools, gun shows, patriotic air shows, that sort of thing. You know, the places where we’ll find people who are interested in World War II history. BC: How many of those do you do a year? RK: We average about eight. Eight shows a year I think is what we are doing. RK: A lot of them. BC: How many are still able to travel? RK: Now are you talking about people we take to sign books? RK: Right now, we’re down to the “Enola Gay” navigator, and we take a veteran of the “USS Indianapolis”. And those are the two fellows that we’re working with. And with regards to the “Indianapolis”, if you are involved in any kind of research on the atomic bomb, you’re going to come across the Indianapolis. You know, it’s such an amazing story what those guys did and what they went through. BC: Did you write about that in your book? RK: No. We didn’t write about the story of the Indianapolis. There were two fellows in the Manhattan Project, Dr. James Nolan and Robert Furman who rode on the “Indianapolis” with the bomb parts for the first bomb. The division of the 509th called Project Alberta, made up of 54 scientists, were kind of the brains behind both bombs. And these guys were stationed on Tinian. 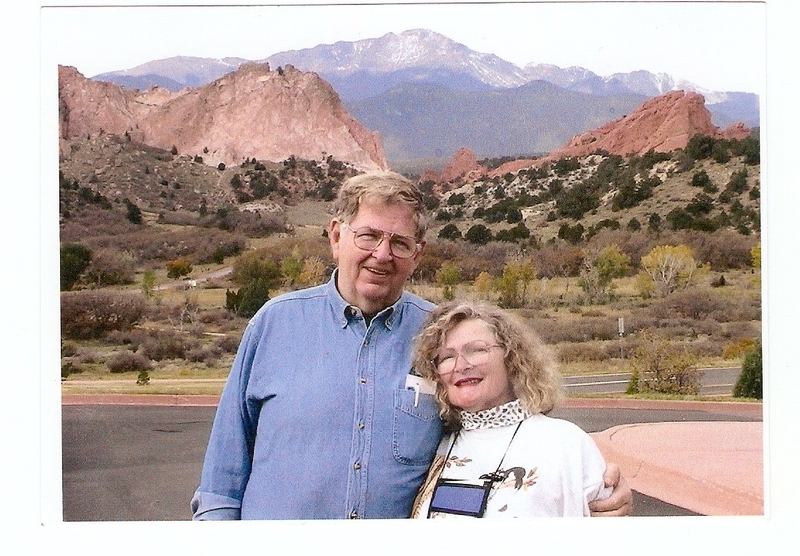 Nolan was a medical doctor and his concern was radiation and he was attached to Project Alberta. RK: Bob Furman just died. Nolan died a long time ago. Furman never was really clear about what he did. It sounded like after he got on Tinian, after the “Indianapolis” docked, he basically just stayed there until the second bomb was dropped and Japan surrendered. And then he became a leader of one of three teams that went into Japan. They were looking for the Japanese atomic scientists. So that’s the only thing I address. I have Nolan’s story and a little story from Bob Furman, as well as a picture of the Indianapolis, but I don’t go into what happened. BC: I forget the name of the famous book on the “Indianapolis”. RK: Oh probably, if it’s an older book, it’s probably “Abandon Ship” or “All the Drowned Sailors”? Or if it was more recent it would have been “In Harm’s Way” by Doug Stanton. BC: “In Harm’s Way”! Yes, that’s the one! When you say recent, did that come out in the last 10-15 years? RK: Oh yes. Stanton’s book came out about 2002, I think. Matter of fact, Stanton contacted me and there is a photo in there that I’m credited with. It’s the picture of Chuck Quinn’s crew, the guys who flew in the Lockheed Ventura that discovered the men in the water. BC: Kuryla. That’s how it’s said. I wasn’t quite sure how to pronounce it. RK: It’s synonymous with gorilla! BC: Oh, okay (laughing) that helps! And ‘Dutch’ Van Kirk, is that the other gentleman you tour with? BC: Where do they live now? RK: Well Van Kirk lives in Georgia and Kuryla lives in Chicago. BC: Do they tend to just travel in the Northeastern part of the States? RK: Yes, pretty much. Right now we’re going to be doing an appearance with Mike on the weekend of December 13th. We are going to be out at the New England Air Museum. And then we’re doing a gun show on the same weekend. New England Air Museum being on the Friday and the gun show, being about 50 miles away, is going to be Saturday and Sunday. We’re following a routine that we did with ‘Dutch’ Van Kirk a year ago. So we kind of tested the waters with ‘Dutch’ (chuckling) and now we’re taking Mike. So basically we’ve gone up and down the east coast. We’ve gone from Massachusetts all the way down to Ft. Myers, Florida. It’s about as far south as we’ve gone. BC: I would think, from a personal point of view, that there is a tremendous interest in these gentlemen and that history. Are you finding that it’s still there? My audience tends to be more high school & college students and teachers. So I’m getting a real crossover. It’s funny that the “Bockscar” story that I wrote, out of 60 stories, is still #3 on the list. RK: Really! Let’s see. How to answer that question! What I’m finding is the greatest interest is from people in my age bracket, the sons of the veterans. And if they bring their children, or grand children …you know, they’re trying to teach them. When we do an appearance, the actual WW II veterans really want to relate their experiences to the veteran that we bring. But from a marketing standpoint, it’s people in my age bracket. We find that when they go and talk at a high school, these kids are not being taught this history in school. ‘Dutch’ has said this to me, and so has Mike, and I’ve been with them to witness this. And so what happens is they have to put some of this material into perspective for them. They almost have to start explaining WW II and ‘Dutch’ does a very good job on that. We show a 15 minute video and in that video it talks about how WW II was an effort from everybody. Men, women and children were all pitching in during WW II. The generations that are growing up now, they don’t see that. BC: I imagine that is the uphill climb. I’m finding the exact same thing. I was talking to quite a few teachers from the Western Southern Tier, New York, and they all say the same thing. It’s a real battle because the kids are bored. They’re a little out of touch with history. Everything’s current and fast paced and history for them is what they ate last week. RK: Right. Times are different today. You know, when I was a kid, I collected stamps. And if you look back at the stamps from 1960 and earlier, and I’m going to use this as an example, there was a lot of history on stamps. And that’s how I learned history. I loved history. I was very good at it in school. I mean I didn’t really have to study it, I enjoyed it. I was not a WW II historian at the time. I read American history, mostly Civil War. When I was growing up, the WW II veterans wanted to get the war over with. Lots of those guys didn’t want to talk about it. A lot of them gave their medals away, their patches, their uniforms and all that sort of stuff. I think only in the mid- 1980s or so, people started realizing this stuff was valuable. And collectors came onto the market. Now all this material is very highly collectible and valuable. You know what I like to point out is when I started trying to find these veterans it was very difficult because during the Viet Nam War process, there were a lot of anti-nuclear movements going on. And most of the fellows, specifically from the “Enola Gay”, and some from the “Bockscar”, had unlisted phone numbers. Their addresses were very difficult to obtain. And what would happen was if you could find one of them and you gained their confidence, they would pass you along to another guy. So what I found, when I was trying to locate these fellows in the 1980s, was that it was extremely difficult. Not like it was later in the middle 1990s when it became very easy to locate them. The first fellow I found, I can’t remember how I located him, was George Caron who was the tail gunner on the “Enola Gay”. And a lot of these fellows hadn’t gotten together in all these years. But George knew where Ray Gallagher was. Ray was the Assistant Flight Engineer on “Bockscar” and so I met Ray in 1990 at Wendover. And he looked like he was kind of a grumpy guy but he and I turned out to be fast friends. He worked for AT & T. I don’t know what his background was schooling-wise, but he really was a common man. He didn’t have a great mastery of the English language. But he really put it into perspective for me back then. He said “In order to understand the use of the atomic bombs, you had to live those times”. Basically he echoed what I’ve heard from every other fellow. They all wanted the war to be over with. And Ray felt that they saved many lives by dropping those bombs. BC: I do want to hear more about that, but how long had these gentlemen been in the war? Had they been there from the start, maybe four years or five years or so? RK: How do I answer this one? Okay. The 393rd was training in Nebraska. And Tibbets had been picked in 1944 to head up the 509th. So Tibbets went to the 504th Bomb Group and chose the 393rd. He took the 393rd Bomb Squadron out of the 504th, took them to Wendover, and then at that point, they started adding more men to it. They became a composite group which was totally a unique group. They had their own transport planes. They had their own doctors, their own veterinarians. They needed nothing, absolutely nothing! If they had to go off base to get something it was entirely secret. BC: And this group was together, from start to finish, a little over a year? RK: That was it, yeah! Really from September ‘44 to about December ’45 is when they came back. They were brought back to Roswell, New Mexico. And that’s where they were discharged from. Most of them were discharged between December ’45 and March of ’46. BC: How many were in the group in its entirety? RK: I’d hate to have you quote me on this but it’s 1700. About 1770 or something like that. BC: So let’s get back to your original story about Ray Gallagher, before I interrupted you. I was pretty fascinated with that. RK: Well, you had asked about the experience that these fellas had. It’s hard to say how the men were picked. I don’t know who picked them and I don’t know if they had some sort of committee or how all these guys came to Wendover. Ray was probably one of maybe about 25 men. To understand better, we have to go back here a little bit…. Paul Tibbets flew a B-17 over North Africa. And he had 40-some odd missions. This is where I’d need to go to the reference books. But he had a lot of missions over North Africa. And his navigator was ‘Dutch’ Van Kirk, his bombardier was Tom Ferebee. And so what happened was that Paul was brought back to the United States after he flew all these missions to become part of the training program for the B-29…the training and development. He was stationed down at Eglin Field. And while he was down at Eglin Field that’s where he met guys like George Caron, Ray Gallagher, Don Albury, Chuck Sweeney and Jim Van Pelt. The list goes on. Tibbets put out the word that he wanted these guys brought in and so that’s how Ray Gallagher got into the 509th, which is kind of unique too, because Ray wore eyeglasses. He was put on the crew of “The Great Artiste”, which was the original crew plane, with Don Albury. Ray was given dispensation because of the fact that he wore glasses. RK: But at any rate, Fred Bock for example, was flying an airplane on December 7, 1941 when Pearl Harbor was attacked. And he was flying B-17s from the US over to India in early ’42. So here was a guy in the war for 5 years with all that experience. But then there were new guys in the 393rd that had just come into Fairmont, Nebraska when the 509th was put together…when the 393rd was pulled out of Fairmont to go to Wendover. BC: When the final decision was made, for the series of planned bomb droppings, I understand that the first two were not the only ones planned? RK: No, there were four cities originally. Nagata was one that’s never really been talked about. The first target was Hiroshima, second one was supposed to be Kokura, third Nagasaki and fourth was Nagata. I think that was the order. There had also been some conversation about Tokyo. BC: So on the second bombing mission they were supposed to hit Kokura? But instead they went to Nagasaki because it was…? RK: Obscured by cloud cover and smoke. BC: Nagasaki would have been the third target anyway? BC: Did they run into any opposition during those first two missions? RK: You know there’s a book by Norman Polmar, which he wrote on the 50th anniversary, I think, of the “Enola Gay” … when the “Enola Gay” came out at the Smithsonian. I think it’s just called “Enola Gay”. This fellow Polmar is a historian that they seem to use on the History Channel for all sorts of things. And in his book he states that Jacob Beser said that Japanese fighters came up, and they banked and departed. According to Van Kirk, that’s totally untrue…totally untrue! So that never happened! The planes were specially built and could fly higher and faster than the Japanese could. BC: The Pacific conflict has always intrigued me, and getting to know more about the 509th is a real treat. Thank you. RK: It’s such an interesting piece of history. The more I read and the more I met these fellows it just became fascinating. But it took awhile for me to get these missions straighten out. For instance, who flew what plane? Because none of the planes flew with nose art on them, the only way to know what plane you were in was if you looked at the serial number on the tail. RK: Right! And the only guys really concerned with that would be the navigator and the flight engineer and the assistant flight engineer. And they switched planes quite a bit. BC: How many planes flew on those runs? RK: The 509th had 15 planes total. But there were over 80 special planes built. Two planes that I know of stayed at Wendover. As well there were two crews that stayed at Wendover and were assimilated into the 509th when the 509th came back to Roswell. They then moved these two crews from Wendover to Roswell. BC: On the first Hiroshima run, how many planes actually flew in that mission? BC: Oh wow, I never knew that. RK: Well, to start, there were no escorts. So, an hour before the strike plane went out, they sent out three weather planes. And those planes…one went over Hiroshima, one went over Kokura, one went over Nagasaki. And they were to report the weather back. Then the “Enola Gay” took off and it was accompanied by “The Great Artiste” and “Necessary Evil”. “Necessary Evil” was the photo plane and “The Great Artiste” was the instrument plane. The “Enola Gay” got the word “No dense cloud cover. Okay to bomb primary”, so they headed straight to Hiroshima. And as those planes were coming back, the “Enola Gay” and the other two were heading out. Passing back and forth they didn’t see each other visually. And then there was another plane that was on Iwo Jima. They had a bomb pit on Iwo Jima for emergencies and that was McKnight’s plane. I can’t remember which. I usually have to look at the book for this one because he flew two different planes. Neither one was his crew plane. His crew plane had an engine out. And his crew plane was top secret. I think it was the “Big Stink” on the first mission. And that plane was sitting on Iwo Jima with the engines running, with two security men on board. BC: And the purpose of that plane was to…? RK: Well, if the “Enola Gay” failed for any reason they would land on Iwo Jima and transfer the bomb to that plane. RK: But the “Enola Gay” crew would still carry the bomb. BC: Okay. So the crew would literally just switch and take off again? RK: Right. You were aware of the fact that the bomb was loaded from underneath? RK: Well, what they did was they trailered the bomb from the bomb assembly hut. They put this trailer over the bomb pit and if you remember the service stations years ago, they had one big massive cylinder that would raise the car up and then down. Basically that’s what they did. They’d lowered this trailer down into the pit then they backed the plane over with a tractor, like a caterpillar tractor. Actually it was a Cletrac, was the name of it. Anyway they backed the plane over the pit and then they raised the bomb up. And that’s how they loaded it. There were two pits on Tinian and there was a pit at Wendover as well. But they didn’t load any bombs over there with fissionable material in it. BC: Was there a reason they had two different, I’ll call it, type of bombs for the first two runs? RK: Well yes. If you took all the Uranium that Oak Ridge could produce, it took two years to produce it. I’m not sure how you make Uranium but it took two years to produce all the Uranium for that first bomb. And they just couldn’t manufacture any more of it. So therefore they went to the Plutonium which was more readily available and easier to manufacture. Plutonium, I believe, came out of Hanford, Washington, that plant. But Oak Ridge took two years to come up with the Uranium. BC: Did this also include the tests that they ran in the deserts? BC: It makes you wonder if they would have been ready two years before if it didn’t take that long. RK: No, they wouldn’t have. I’m better at the 509th history rather than the bomb and Einstein’s letter. But I think Einstein wrote to Roosevelt in what, 1939 or 1940 asking that they do something because the Germans were looking into it. BC: Well, Mr. Krauss, this has been extremely interesting for me! It’s been great. I know we barely touched upon so many possible aspects of this subject but I am so happy that we did get a chance to speak. As we have discussed, we’ll plan on doing a “Part II” to this interview in the near future. I really appreciate your time. It’s been a pleasure. BC: And I look forward to talking to you again. BC: Thank you. You too! NOTE: Mr. Krauss and I will be doing a live follow up interview early into the New Year. I encourage you to send me your questions or observations so I can present them to him at that time. And remember, the only place you can purchase Mr. Krauss’ book, “The 509th Remembered” , other than at live appearnces, is on his website at www.enolagay509th.com. I have my copy and it’s a terrific reference book (my favorite kind!). 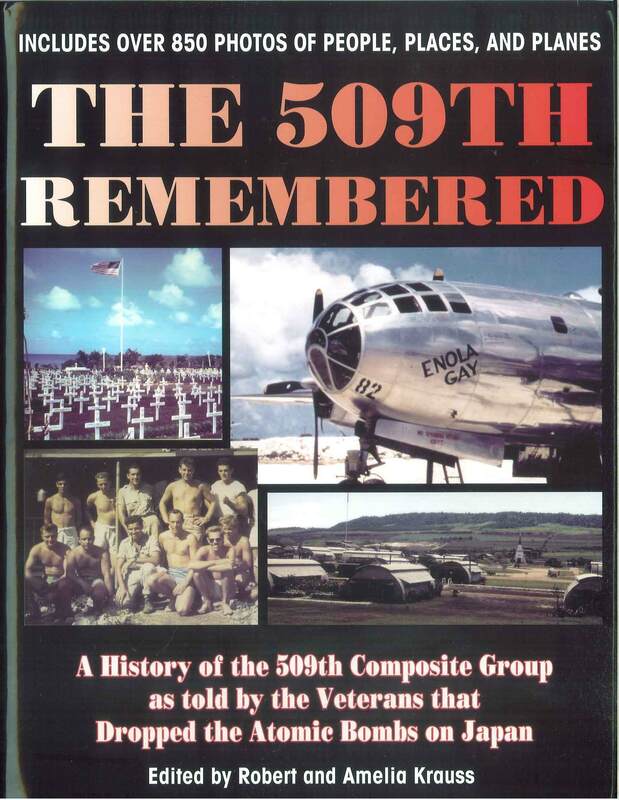 If you are interested in the men of the 509th and want to learn about what it was like for them to be a part of this dedicated team, I encourage you to order one today. If you do order a book from Bob and Amelia, they would love to know if you found out about it from this article. Please be sure to let them know. Thank you Bikini. I appreciate your kind words. I’ll keep writing if you keep enjoying. Thanks Ali. I appreciate your word! LOL. My oldest brother Jim was part of the 509th Bomb Group & my brother Ed was a survivor of the USS Indianapolis & I served in the Military Police during the bomb tests in the Marshall Islands in the mid 1950’s & later at CampHanford, Washington, USA. My brothers Bob & Tom both served in the Army & navy respectively. Hi Dan: Thank you very much for letting me know about you and your brothers. You must be so proud of your family’s military service. It’s an honor to speak with you. I passed on your comments to Bob Krauss and he wrote me back the following. “Barry. I received a book order from Ed Brown. 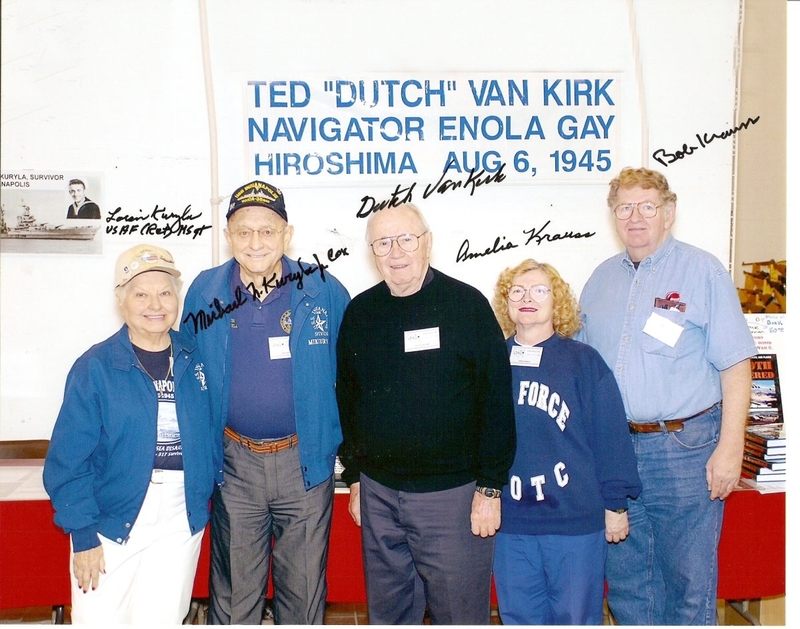 Ed was on the USS Indianapolis and survived the sinking. He did operate the crane that off loaded the bomb crate. His brother George J. Brown served in the 393rd bomb squadron, 509th Composite Group. Amazingly this was not the only one. Bob Haider, a groundcrewman on Bockscar had a brother-in-law, Paul Podish, who served on the Indianapolis and survived the sinking as well. My dad was in the 393rd bomb squadron, 509th Composite Group and I am trying to reach anyone that has information about the members of the 393rd. I’m looking for information about anything that he did. If anyone can give me any information or tell me were I can look I would appreciate it. I knew a Pat Robbins as part of the 393rd Radar Section. He was originally from Georgia. I made contact with his widow, who lived in Florida. Are you his son? I am seeking information for a 509th CBG insignia. The circular insignia is of a dragon and B-29 superimposed upon a five pointed star. When was this insignia designed? And, was this insignia attached to “Bockscar”? Hi Cisco: Thanks for writing. I do not have answers to your questions but will forward it to Robert Krauss and see if he can help you with this information. I will forward any response he sends back to me. The patch with a dragon holding 2 bombs riding a B-29, I saw at Fairmont AAF when the 393rd was part of the 504th. You would think that it represented to the 2 A-bombs, but that’s not the case. Dear Mr. Krauss: My father, who is now 92 years old, is a past member of the 509th Composite Group. He recently mentioned a few his experiences, and I was wondering if you keep records on how many members of that group are still alive.